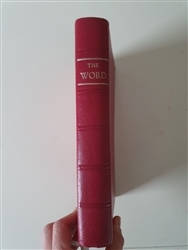 Beautiful, large, leather bound display copy of the Word in Latin, Hebrew, and Greek. Over 7,000 side notes clarify scripture passages. Over 500 articles and study aides. Colorful, easy-to-use format. New International Translation. ISBN: 9780310938041, hardback, 9.5 x 6.5 inches. First published in 1965, this fully illustrated children's Bible is one of the most comprehensive, covering 125 stories in 500 pages. Although some have objected to the blond, blue-eyed depiction of Jesus, many agree that this version is still one of the most thorough children's Bibles available. Contains verses from the King James Version arranged topically, bible thematic outlines, more than 100,000 Scripture references and definitions of all persons, places, objects, and events in the Bible. Devlop sermon outlines, prepare Sunday school lessons, or enhance devotional reading. <How are we to reconcile a literal reading of the Creation story in the Bible with what science tells us of how the universe and humankind came to be? Based on the ideas of Emanuel Swedenborg, Roger's book points the way to a deeper symbolic meaning hidden within the narrative of Genesis 1. 215 pages, 5 1/2" X 8 1/2", paperback. Unlock it's inner meaning and open the door to your spirit. For readers new to Swedenborg, A New Key to the Bible serves as an overview of the thousands of pages Swedenborg wrote about the inner meaning of the Bible. Swedenborg's vision gives us a new way to experience the beautiful, uplifting message that goes beyond the literal meaning of its words. 2018. 148 pages. 5 1/2 by 8 1/2 inches. ISBN 0877853088.